On May 18, 2018 at 15:00 Doctoral dissertation will be held at ՞Informatics՞ 037 Specialized Council, functioning at the Institute of Informatics and Automation Problems of the National Academy of Sciences of Armenia (see abstract: Gurgen Harutyunyan - Built-in test solutions for nanoscale memory devices and systems). On June 7, 2018 at 16:00 Doctoral dissertation will be held at “Informatics” 037 Specialized Council, functioning at the Institute of Informatics and Automation Problems of the National Academy of Sciences of Armenia (see abstract: Hasmik Sahakyan – Existence, Construction and Description of Structures Given by Partial Characterization in Discrete Models). On June 18, 2018 at 11:00 PhD dissertation will be held at “Informatics” 037 Specialized Council, functioning at the Institute of Informatics and Automation Problems of the National Academy of Sciences of Armenia (see abstract: Hajk Grigoryan - Development of Systems for Problems with Hight Performance Computing and Big Data). On June 18, 2018 at 12:00 PhD dissertation will be held at “Informatics” 037 Specialized Council, functioning at the Institute of Informatics and Automation Problems of the National Academy of Sciences of Armenia (see abstract: Hajk Nahapetyan - (Development of software tools for investigation of dynamic processes in self-organized systems). On June 18, 2018 at 14:00 PhD dissertation will be held at “Informatics” 037 Specialized Council, functioning at the Institute of Informatics and Automation Problems of the National Academy of Sciences of Armenia (see abstract: Boris Atayan - Big data cloud backup system research and development). On June 19, 2018 at 11:00 PhD dissertation will be held at “Informatics” 037 Specialized Council, functioning at the Institute of Informatics and Automation Problems of the National Academy of Sciences of Armenia (see abstract: Hamlet Khachatryan - Development of Systems for Problems with Hight Performance Computing and Big Data). 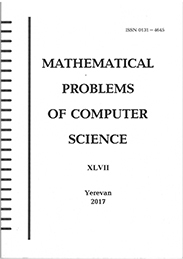 On June 19, 2018 at 12:00 PhD dissertation will be held at “Informatics” 037 Specialized Council, functioning at the Institute of Informatics and Automation Problems of the National Academy of Sciences of Armenia (see abstract: Vilyam Hovnanyan - The Development of the Methods and Algorithms for the Design of Optimal Schemes in Computer Networks). On June 19, 2018 at 14:00 PhD dissertation will be held at “Informatics” 037 Specialized Council, functioning at the Institute of Informatics and Automation Problems of the National Academy of Sciences of Armenia (see abstract: Raffi Simonyan - Development of the system of object detection, recognition and localization in videos). On August 10, 2018 at 16:00 PhD dissertation will be held at “Informatics” 037 Specialized Council, functioning at the Institute of Informatics and Automation Problems of the National Academy of Sciences of Armenia (see abstract: Ruben Aghajanyan – Modeling of Complex Systems by Means of Stochastic Calculus).